Buying a bag of potatoes is a commitment, let me tell you. 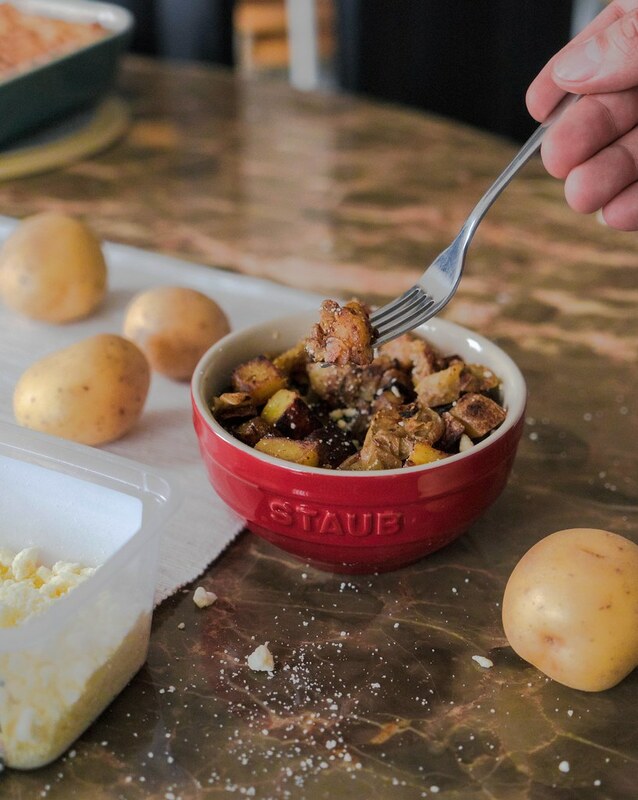 Extending onto my sheperd’s pie recipe, another potato addition is hash! Boy do I love hash. This is now a new series: “What To Do With That Bag Of Potatoes (Before It Grows Spores)“. Influenced by an incredibly delicious plate of diced potatoes cooked in a cacio e pepe style at Box Car Social (which I fail to see on the menu now — did I imagine it?). After trialing this dish, it did turn out tasty, but just not the same flavours. After further chatting to my previous diners at my failed attempt as no flavours were alike… I was missing one key ingredient: Salted duck egg yolks (oops). In my defense, every bite I did have didn’t have a clump of salted egg yolks at all — well then, that’s a recipe for another time. As for these, this was quick and easy, a great snack and side to serve along a meal. For potatoes, I used new potatoes. Young potatoes, very low in starch. Great for this recipe as they’re waxy, firm and sweet. For the topping, Krinos feta was the perfect fit, already crumbled and ready to sprinkle. Dice up potatoes in 1×1 cm size pieces. 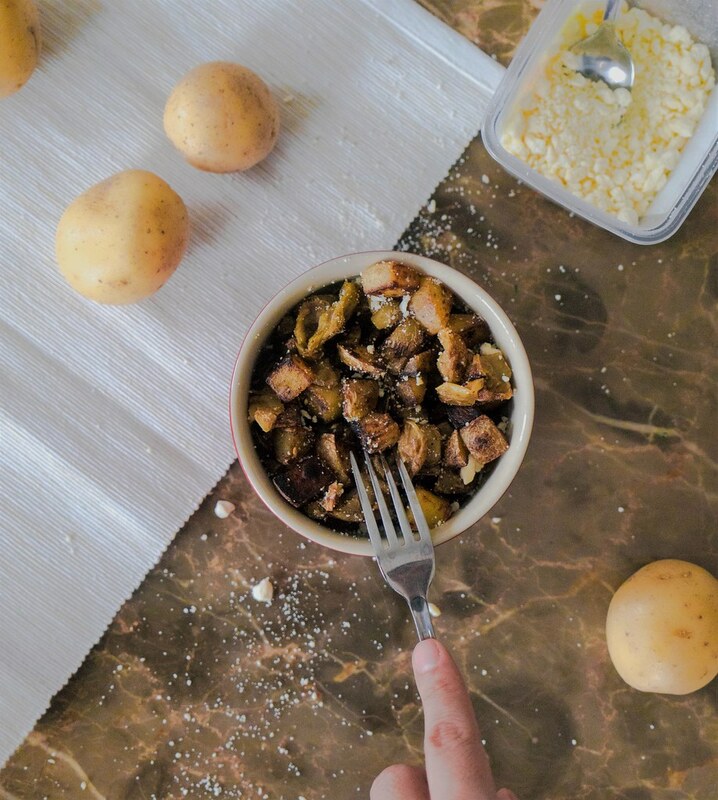 Season potatoes in a separate bowl and let sit for 15 minutes. 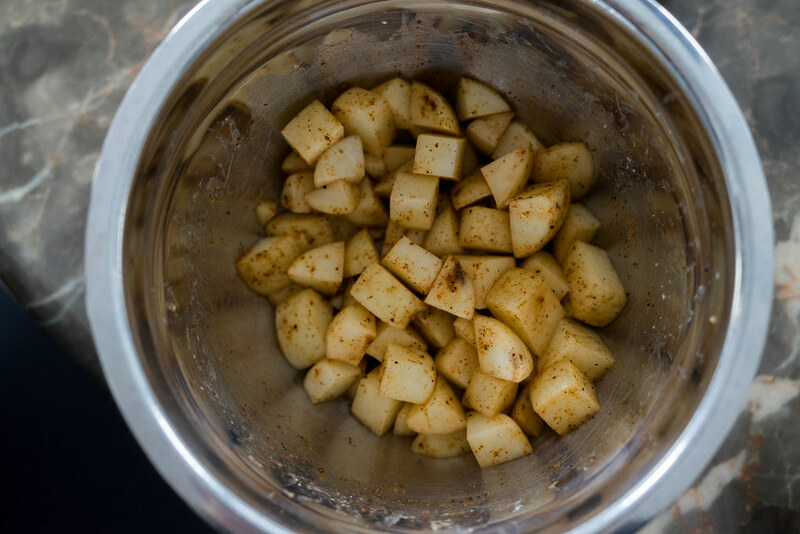 In a pan on medium heat, cook the potatoes stirring occasionally. After 15 minutes, pierce + taste whether it’s ready to go off the heat. Season with pepper and sprinkle feta.